It’s day two of our freezer fill up and I am so glad you are back. Yesterday we covered freezer corn today we are moving on to a ready made meal. These are my favorite things to have on hand. Delicious homemade goodness ready to be baked at a moments notice. Pastry or your own homemade ones. Alright lets get started. 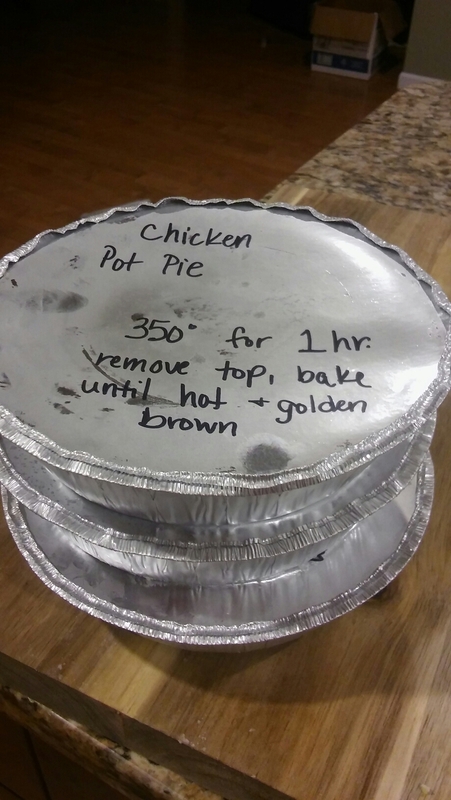 Please note when I made this batch I made enough for one large pot pie in a 9″ pie pan, and three 7″ disposable freezer pie pans. 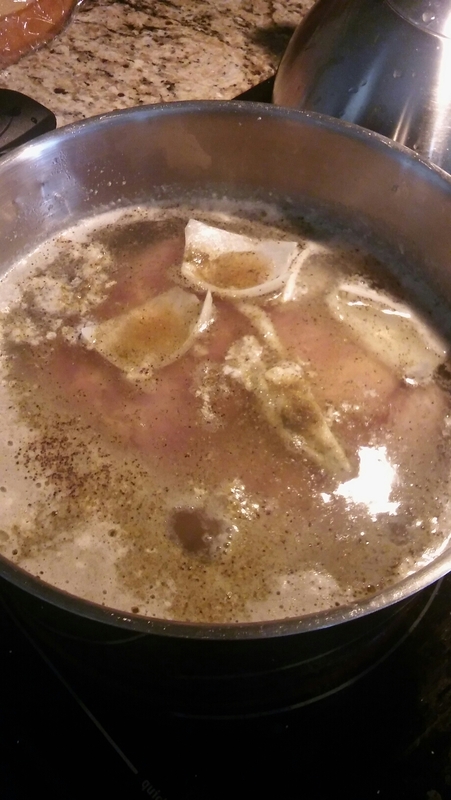 First take your chicken and put it in a large stock pot with plenty of salt (2Tblspn) some pepper(1/2teaspoon) and half of an onion. Cover the chicken completely with water and bring to a light boil for an hour or until the chicken is fully cooked and fall’s apart easily. Let this cool and set to working dicing your veggies. You can put in any vegetables you like. 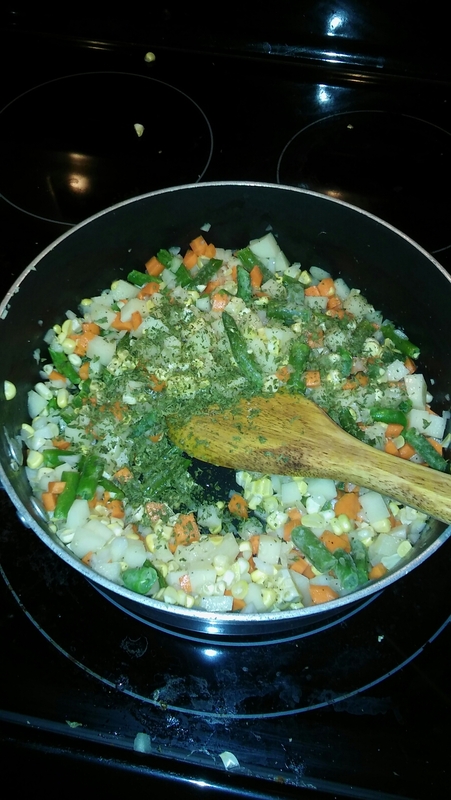 In our home the regular add in’s are potato, corn, carrots and green beans or peas. We also add the other half of the onion. Get a sauce pan nice and hot and melt three tablespoons of butter in it. 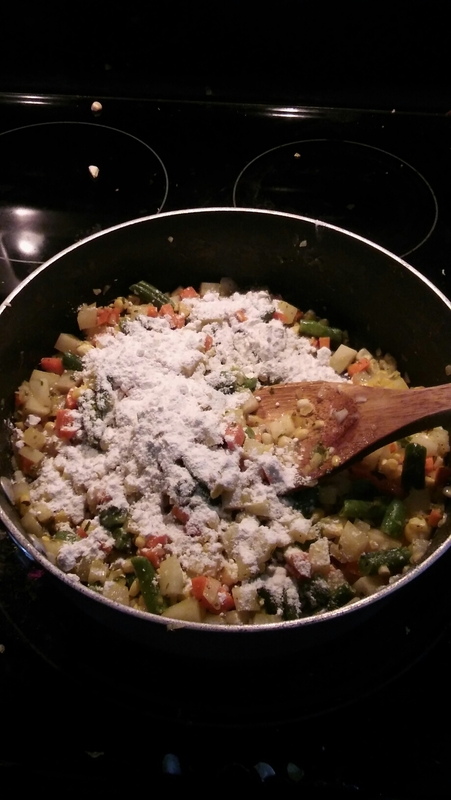 Then add your veggies. Saute them for three to five minutes or until the vegetables are starting to turn. Potatoes and onion will become translucent. 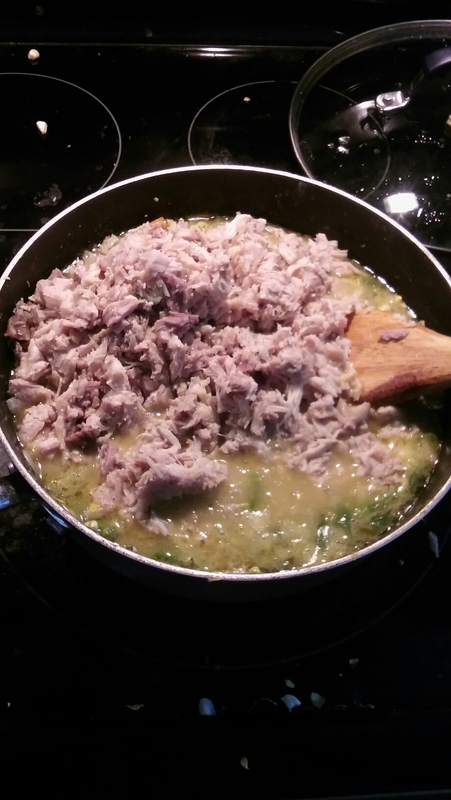 Sprinkle 1/4 cup of flour over the mixture and let it absorb all of the juices. Ladle the broth from the chicken pot into the sauce pan. I added about three to four cups. Liquid content is based on preference. Pull your chicken out and dice it all up. 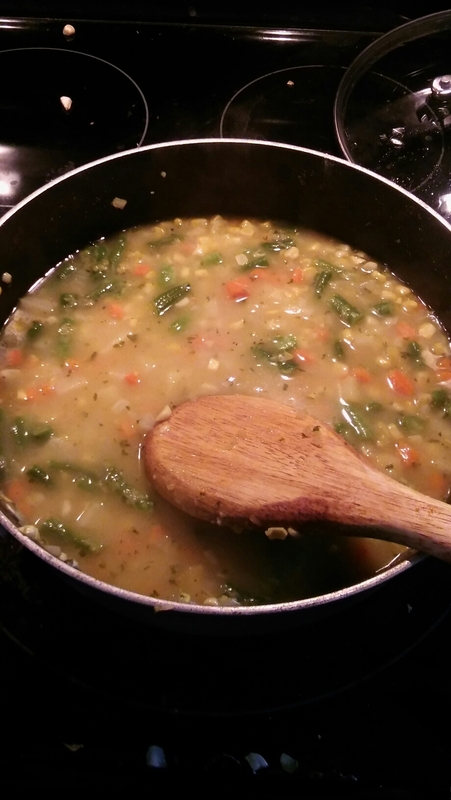 Add it to your pan as well and stir it all together. Here I usually add salt and pepper to taste and thyme. Using your pie pans fill each crust about 2/3rds full. Do not over fill as this could boil over later. 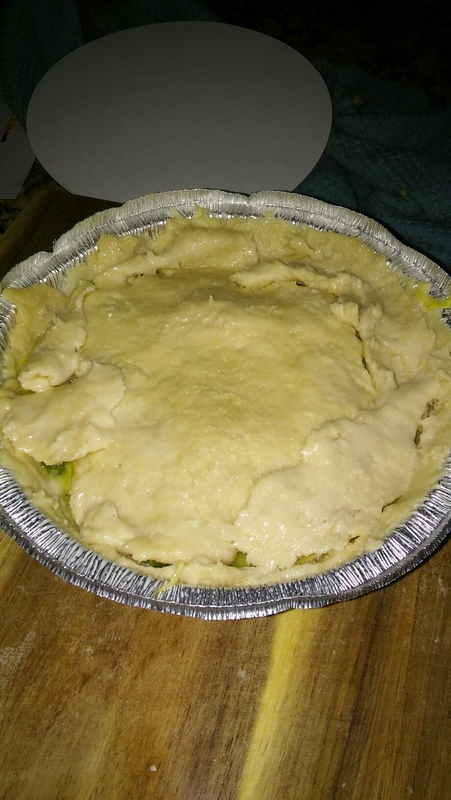 Place a crust on the top, label and freeze. To cook simply pull from your freezer and bake at 350 degrees for about an hour. Remove the lid part way through so you get a nice golden brown crust. Enjoy! This is well worth the time when you have three spare meals frozen for later.